One way to generate the local approximation of the objective function around is to make Multivariate Lagrange Interpolation. We will sample at different points and construct a quadratic polynomial which interpolates these samples. The matrix above is called the ``Vandermonde Matrix''. We can say even more: What happens if these three points are on the same line? There is a simple infinity of planes which passes through three aligned points. 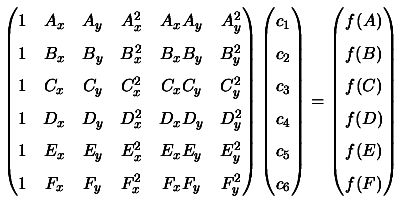 The determinant of the Vandermonde Matrix (called here after the ``Vandermonde determinant'') will be null. The interpolation problem is not solvable. We will say that ''the problem is NOT poised''. In opposition to the univariate polynomial interpolation (where we can take a random number of point, at random different places), the multivariate polynomial interpolation imposes a precise number of interpolation points at precise places. In fact, if we want to interpolate by a polynomial of degree a function F , we will need points (with ). If the Vandermonde determinant is not null for this set of points, the problem is ``well poised''. Beware! Never try to resolve directly Vandermonde systems. These kind of systems are very often badly conditioned (determinant near zero) and can't be resolved directly. If we already have a polynomial of degree and want to use information contained in new points, we will need a block of exactly new points. The new interpolating polynomial will have a degree of . This is called ''interpolation in block''.